Back in high school, a friend suggested we build a remote control machine of some type. It might have been some kind of robot, I can't remember specifically. We called it the AE-35 antenna unit, a reference to 2010. For some reason, the idea of wireless control and telemetry intrigued me. I had read quite a bit about radio receivers, so I figured it wouldn't be hard to do. After all, low cost pocket radio receivers looked relatively simple inside. I was wrong. That small inspiration lead to a 2 decade interest in wireless communications that continues to this day. That simple idea of transmitting a signal, even a short distance, lead to years of study and experimentation. I built a multitude of circuits, most of which didn't work very well. I studied the rigors of information theory, antenna fundamentals, and the black art of RF design. Clearly, I could copy existing circuits and reproduce other peoples results, but that wasn't good enough. Commonly used techniques always seemed too complex. I wanted to build simple circuit, just a handful of transistors. I was willing to trade off performance for simplicity, the ultimate specs need challenge the state of art. I started by building local oscillators to mix the RF from the antenna down to a more reasonable IF. I was fairly successful with LC oscillators, but I didn't like the idea of tuning. I wanted quartz crystal stability. I had good success with fundamental mode crystal oscillators, but overtone oscillators seemed elusive. The books made it all seem so simple, but somehow, I couldn't make it work reliable. The oscillators I built would invariably oscillate at the fundamental mode rather than the desired overtone. Even worse, my oscillators would sometimes start squegging uncontrollably. For years, I was obsessed with the idea of an RF operational amplifier. High frequency op-amps are commercially available, but they usually require a lot of power. More importantly, their gain-bandwidth is usually not high enough. I thought of a combination mixer-amplifer. I figured that if I could mix the RF down to a more reasonable frequency, an op-amp like structure could work. I tested my idea with a CA3080 transconductance amplifier. I fed an RF signal generator into the amplifier bias and terminated the output with a 15kHz LC tank. To my surprise, the circuit achieved a gain of more than 55 dB! Of course, it didn't work well beyond 60MHz or so. The CA3080 turned out to be a great device, but it's old and becoming harder and harder to find. From what I gather, the last production line was shut down and none of the new lines support the original process. Even still, 60MHz is quite impressive for a device that was made for audio! It's a combination oscillator/mixer/IF amplifier using exactly one LM3046, a matched transistor array that's commonly available. 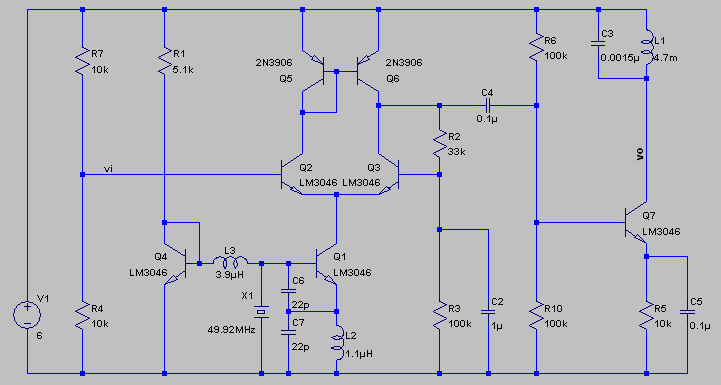 This circuit achieves a gain of more than 100dB using only a few milliamps of current. It's best to connect the substrate pin to ground, which is the emitter of Q4 above. The IF is 60kHz, which is a convenient number given the 49.920 MHz crystals I happened to find at low cost. The RF is 49.860 MHz, which is commonly used for radio controlled toys. The real beauty of this circuit is that it scales well in frequency. The LM3046 is good up to about 100 MHz, but it can be replaced with one of several Panasonic high frequency transistor pairs available from Digi-Key. There are some with transition frequencies (ft) of more than 8 GHz. Ideally, the PNPs should also be matched, but I found that hand matched discrete 2N3906s or 2N2907s work fine. Panasonic makes dual PNPs also.